An equally good title could be "The Battle at 2800 Wall Street" since the 2800 level has become quite a challenge for the S&P 500 Index. The three charts below add some perspective along with some encouragement for the bulls. No April fools verse here. S&P 500 Index (SPX) 2834.40 gained 33.69 points or +1.20% last week with the 50-day Moving Average at 2755.61 just below the 200-day at 2756.29. On any pull back the 200-day Moving Average should provide solid support. A closer look at the operative upward sloping trendline from the December 26 intraday low shows it crosses at about 2860 so it has more to go from this point of view. The charts below add details. 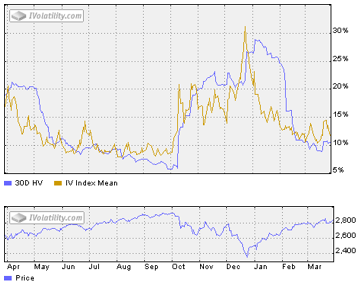 CBOE Volatility Index® (VIX) 13.71 dropped 2.77 points or -.16.81% last week. 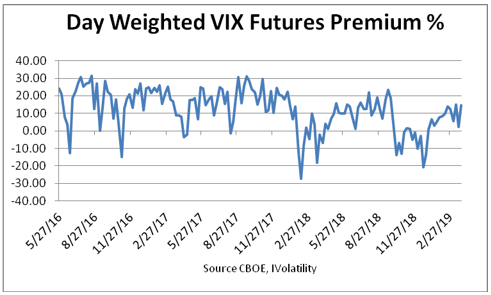 Our similar IVolatility Implied Volatility Index Mean, IVXM using four at-the-money options for each expiration period along with our proprietary technique that includes the delta and vega of each option, declined 2.56 points or -17.96 ending at 11.69, see below. The volatility and line charts above, show another bullish turn for SPX and implied volatility headed lower once again. With 12 trading days until April expiration, the day-weighted premium between April and May allocated 60% to April and 40% to May for a 14.57% premium vs.2.22 % for the week ending March 22, back into the green zone between 10% to 20% associated with S&P 500 Index uptrends. First this semi-log chart shows the long-term upward sloping trendline, USTL from the March 6, 2009 low at 666.79, with the current close right on the trendline. Zeroing in, this one show it from the February 11, 2016 low at 1810.10. From this viewpoint it has a way to go to regain the uptrend. The difference is likely due to using semi-log charts. Now for the current operative upward sloping trendline from the December 26 low at 2346.58. From this perspective the upward sloping trendline, USTL crosses at about 2860 so the SPX remains below the operative trendline while tracking it higher. It could get a boost when the 50-day Moving Average closes above the 200-day Moving Average as some algo programs likely use this, or some similar crossover, as one of their buy conditions. Could happen this week. While the USTL could provide some resistance a retest of the October high at 2940.91 seems likely. Last week the S&P 500 Index recovered somewhat from the yield curve inversion blues moving back up toward the operative upward sloping trendline after struggling around the 2800 level. Although still below the important trendline, perhaps it will receive a boost when the 50-day Moving Average closes above the 200-day Moving Average triggering some algo buy orders. Next week will include some additional details about trendlines and their relationship to option trading strategies.